Ann Cleeves has become synonymous with Shetland: both the place and the television series of the same name. And, although the best-selling author’s final Shetland-based novel, Wild Fire, featuring Detective Jimmy Perez, will be published in September, she has no intention of leaving the islands behind. After all, as she told the Press and Journal, they have been a significant part of her life for more than 40 years. Ann said: “I first went to Shetland just as oil was coming ashore in the 1970s. Lerwick had the feeling of a gold rush town, which was suddenly full of strangers: contractors building and servicing the accommodation blocks at Sullom Voe and oilmen on their way out to or back from the rigs. “Away from the oil-related activity, life still continued much as it has for generations – there was low intensive farming on the crofts and fishing families still braved the elements and went out into the North Atlantic. “But, in the last 40 years, oil has brought many changes to the islands. The oil revenue was put into charitable trusts and brought with it an affluence which meant Shetland weathered much of the economic disturbance that has affected the rest of the UK. The roads are superb, every small community has its own leisure centre and swimming pool, and there is little unemployment. “But now, of course, the situation has changed again. Although there has been outside investment in the new gas terminal at Sullom Voe, much less oil is coming ashore and the money invested when times were good is earning a lot less interest. “For the first time in decades, Shetlanders have been forced to consider whether they can afford the infrastructure and the new projects they would like to create. “It seems to me, though, that they have always been survivors. Fishing generates a higher income within the islands than oil does and Shetlanders are dynamic and flexible. Already, they are looking to attract a very specific type of tourist through Wool Week and the huge number of arts and music festivals. Ann had a heartfelt message for the many people across Shetland who have offered their backing to her through the decades. She said: “I’d like to thank Shetlanders for their support, hospitality and generosity throughout the writing of the novels. 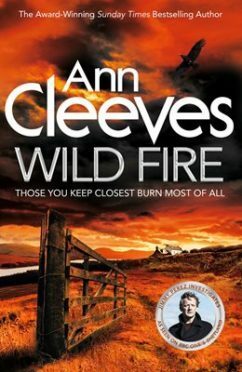 Wild Fire by Ann Cleeves is published on September 6 by Macmillan in hardback, priced £16.99.